Mews Hotel01924 273982work InnThe Mews Hotel is located in Ossett. It is set in an attractive courtyard with a wealth of historic features. All 14 en-suite rooms are very tastefully furnished with colour TV and tea/coffee making facilities. A very cosy public bar serves hand pulled traditional ales. The hotel also has a popular restaurant which offers an excellent menu combining both traditional English fayre and speciality dishes using only the freshest ingredients, sourced locally wherever possible. 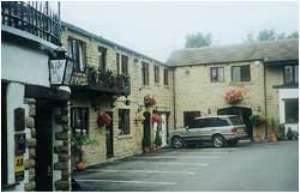 The Mews Hotel is located in Ossett. It is set in an attractive courtyard with a wealth of historic features. All 14 en-suite rooms are very tastefully furnished with colour TV and tea/coffee making facilities. A small meeting/function room is also available and can be used for private parties. With ample on site parking the Mews is situated just off the M1 at junction 40 and is ideally located for both Leeds and Wakefield. From the M1 leave at jct 40 and take the Dewsbury exit. Follow signs for Ossett, approximately 0.75 miles on Dewsbury Road. Turn left onto Dale Street, The Mews is 200yds on right. Right out of station. Follow signs for Dewsbury/M1 Leeds. At motorway roundabout take Dewsbury exit then follow road directions.